Exterior concrete should be protected with an outdoor clear concrete material system. Turning Point Supply has a broad selection of the best clear exterior concrete sealer products for any project. Protect new stamped concrete with a UV stable clear concrete cure and seal product. Select a workhorse outdoor clear concrete sealer for older work and to seal over cured concrete. Choose one of our high performance Silane acrylic clear concrete sealers for colored thin concrete overlay projects. If your current supplier carries only one or two options for outdoor clear concrete material systems then it is time for you to consult the Concrete Experts at Turning Point Supply and learn more about clear exterior concrete sealer products. HS200 Clear Silane Acrylic Performance Concrete Sealer provides maximum protection for cured exterior concrete. The Silane acrylics of HS200 keep the solvents open longer for slower evaporation, helping drive the premium acrylic solids deeper into the surface of concrete for a higher level of performance and extended service life. HS200 Clear Silane Acrylic Concrete Sealer is used on stamped concrete, concrete driveways with heavy vehicle traffic, patios, walkways and sidewalks. HS200 Silane Acrylic Sealer from SureCrete Design Products reduces moisture migration through concrete to help minimize concrete efflorescence. HS300 Performance Silane Acrylic Concrete Sealer is a 30% Solids clear sealer for concrete and concrete overlay. HS300 is designed for extreme climates to protect concrete and concrete overlay from excessive freeze thaw cycling. HS300 Silane Acrylic Concrete Sealer is vapor permeable and will tolerate high moisture vapor emission from concrete. The Silane properties keep the solvents open longer for deeper penetration into concrete and concrete overlay, plus an extended open time which makes it easier to roll out evenly. Super 20 Clear Acrylic Concrete Sealer is a solvent-based clear exterior concrete sealer for driveways, sidewalks, patios and other outdoor concrete. Super 20 provided excellent protection to concrete with superior color enhancement. 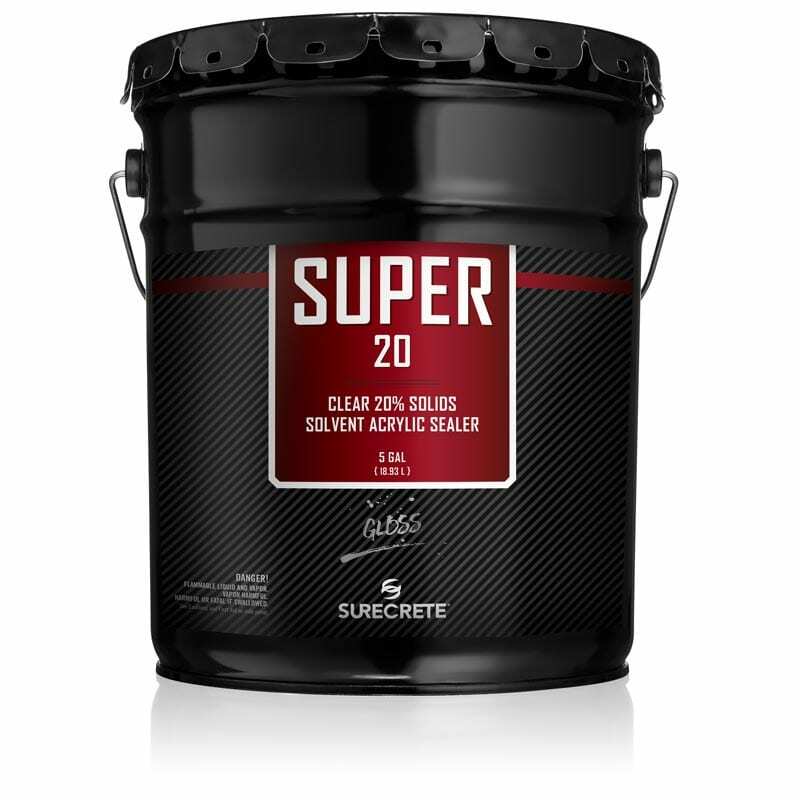 Super 20 finishes as a high gloss exterior concrete sealer with a breathable membrane that minimizes whiting and cloudiness from excessive moisture migration in concrete. Use Super 20 Clear Acrylic Concrete Sealer from SureCrete Design Products on smooth concrete, as a sealer for broom finished concrete and to seal stamped concrete. Super 30 Clear Acrylic Concrete Sealer is a high solids sealer for exterior concrete. Super 30 Concrete Sealer is thirty percent solids for high gloss and excellent color enhancement. Use Super 30 Clear Acrylic Concrete Sealer on driveways, sidewalks, patios and stamped concrete. Super 30 from SureCrete Design Products forms a breathable membrane which will tolerate moisture migration through outdoor concrete. The most broad selection of the best outdoor clear concrete sealer products is found at Turning Point Supply in Charlotte NC and Raleigh NC. These exterior clear concrete sealers are ideal to protect concrete throughout North Carolina and South Carolina. Additional information on these leading outdoor clear concrete sealer products. Shipping is available to anywhere in North Carolina and South Carolina, including Greensboro, Charlotte, Raleigh, Asheville, Wilmington, Greenville, Columbia, Spartanburg, Florence, Charleston and Myrtle Beach. 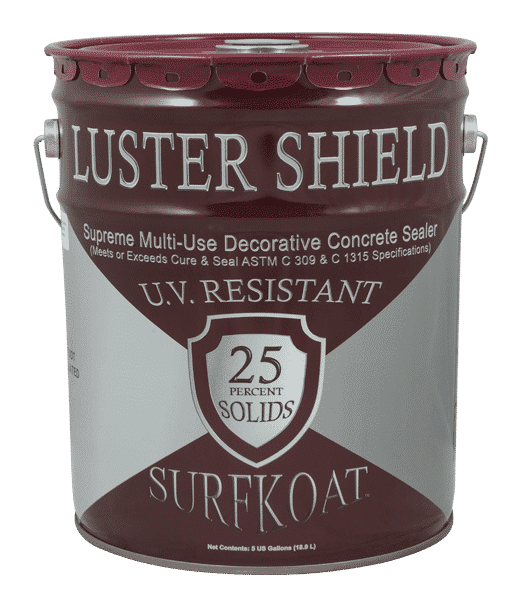 CS250 Concrete Cure and Seal from SureCrete Design Products is designed to help the curing process of newly poured concrete in North Carolina and South Carolina. 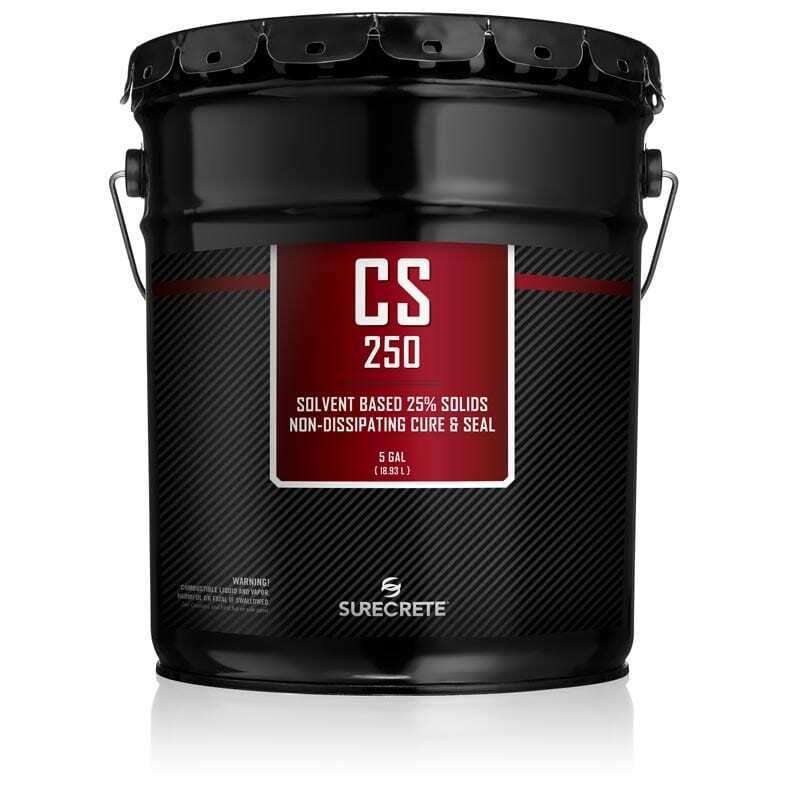 Concrete sealed with CS250 Concrete Cure and Seal shortly after placement retains more even moisture to help increase compressive strength, making the concrete surface stronger and more durable. Cure and Seal helps manage efflorescence, strengthens the cream finish of concrete and helps produce more consistent color enhancement. CS250 is an ideal cure and seal product for a stamped concrete patio. SureCrete Design Products HS200 Clear Silane Acrylic Concrete Sealer is a premium exterior Silane Based clear concrete sealer for durable protection on driveways and pool decks as well as high traffic walkways and sidewalks. HS200 is a 20% Solids (twenty percent solids) silane based acrylic sealer. 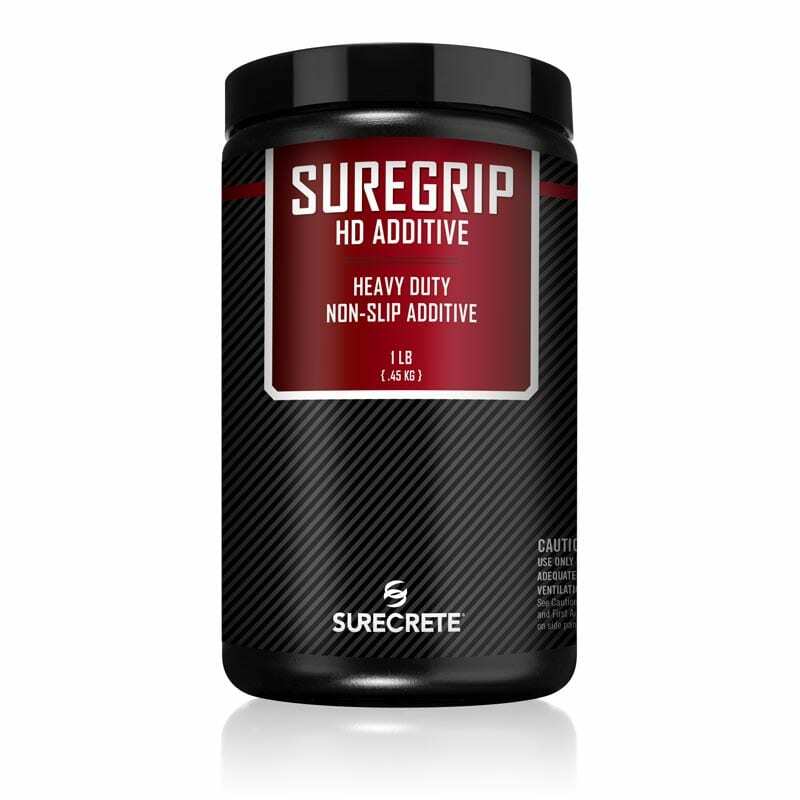 HS200 is Surecrete’s most advanced solvent-based silane acrylic sealer. It is a premium exterior clear stamped concrete sealer that is designed for exterior concrete applications that need attributes such as: slower evaporating solvents, efflorescence reducers, crystal clear finish, and can protect against freeze-thaw elements. HS200 is ideal for vehicular areas anywhere in North Carolina or South Carolina such as driveways, golf cart paths, and other areas where a high gloss clear durable sealer is required. It can also be used in heavy foot traffic surfaces such as walkways, sidewalks, and porticos. The slower evaporating solvents help to give the applicator more time to apply before it becomes tacky and begins to create spider webs. The silane used helps reduce efflorescence, by managing moisture migration. HS200 uses the highest quality acrylics to give a crystal clear, gloss finish on all exterior concrete surfaces. SureCrete Design Products HS300 Silane Acrylic Performance Concrete Sealer is a premium, high-performance, single-component, 30% acrylic solids sealer designed for SureCrete overlays and natural concrete. HS300 is specially formulated for extreme climates, it deeply penetrates concrete and reacts internally with cement, slowing moisture migration and efflorescence and intensifying bond. We in North Carolina, South Carolina and Virginia deal with freeze and thaw cycles that require the high performance and extended service life of HS300 Silane Acrylic Concrete Sealer. Over time and multiple freeze/thaw cycles, when most other acrylic sealers begin to delaminate and detach from the original substrate, HS300 will continue to protect concrete from water and salts. Super 20 Clear Acrylic Concrete Sealer by SureCrete Design Products is a solvent-based exterior concrete clear sealer for NC and SC driveways, sidewalks, and other applications that require a clear sealer to protect concrete surfaces and color. 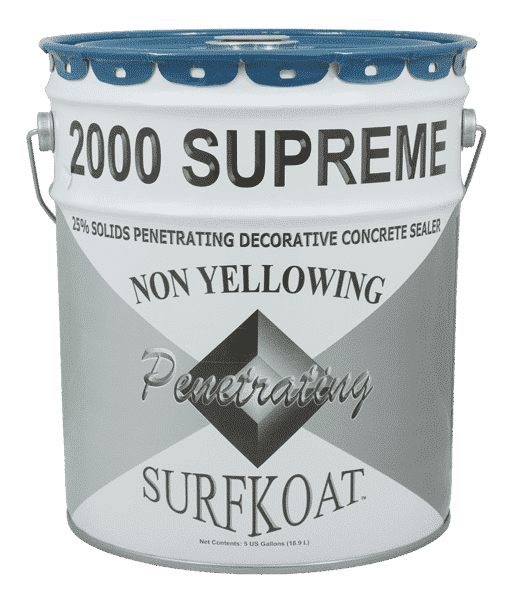 Super 20 twenty percent solids concrete sealer uses quality acrylics to allow for a consistent color enhancement, high gloss finish, and breath-ability that minimizes cloudiness and haziness when moisture is trapped underneath the outdoor concrete. Super 20 is a twenty percent solids, solvent based, crystal clear acrylic, color-enhancing, high gloss finish designed to waterproof, seal, and treat smooth, broomed, and textured concrete exterior surfaces. Choose Super 20 when applying new concrete sealer over an older sealer. Super 20 works great to rejuvenate the color of an older stamped concrete patio. Super 30 Clear Acrylic Concrete Sealer by SureCrete Design Products is a solvent-based thirty percent solids exterior concrete clear sealer for driveways, sidewalks, and other North Carolina and South Carolina applications that require a clear sealer to protect concrete surfaces and color. Super 30 exterior concrete clear sealer is used to protect existing concrete and cement-based overlays. Super 30 clear sealer uses quality acrylics to allow for a consistent color enhancement, high gloss finish, and breathability that minimize cloudiness and haziness when moisture is trapped underneath the outdoor concrete. Super 30 is a thirty percent solids, solvent based, crystal clear acrylic, color-enhancing, high gloss finish designed to waterproof, seal, and treat cement-based overlays on exterior surfaces. Super 30 renews a high gloss sealer on a stamped concrete patio.